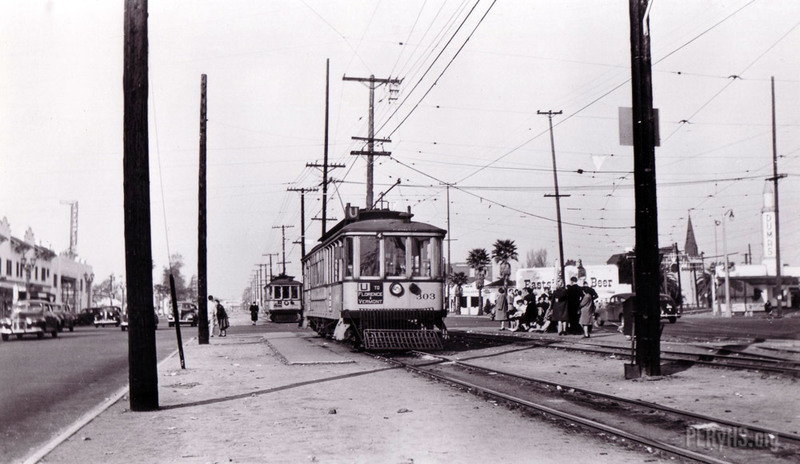 Los Angeles Railway U Line streetcars (led by no. 303) stop at Florence Blvd. passenger loading pads while heading south on Vermont. Note the crowd awaiting the opposite direction car. photographer was looking on Vermont from Florence Ave. The dash sign on the U car says “Florence and Vermont” which is where the U car terminates, the U car turns back here at Florence to return north on Vermont. You can see tracks coming in from the right of the photo, this is the F line converging onto Vermont. The F car continues down Vermont to 116th St.